As a parent, it is sometimes difficult to guide your children towards positive activities that will help them navigate life and to become better people. The world is full of adults who wish that they had been encouraged to learn piano as a child. There is a wealth of evidence that suggests it is much easier to learn an instrument when you are young. Playing piano from an early age will have a positive effect on your child’s mental and physical growth and enrich their life in a number of areas. I was fortunate in that my parents encouraged me to play with the piano at an early age. We had a piano in our house. I have fond memories of sitting with my siblings and playing simple songs and games together. When I was five my mother suggested that I start taking lessons. Children have a wonderful capacity for learning. The piano lessons and practice exercises my teacher gave me really helped my physical coordination. They also gave me some structure on how to approach learning new things. I continued with my piano lessons throughout my school years. I believe that the discipline I gained helped me with my school work, creativity and even my social skills. Interestingly, when my schedule started to fill up with other activities, I was always able to set aside enough time for my music studies. Today, as a music teacher myself, I am continually amazed by my young student’s ability to absorb information and understand subtle concepts. With the right encouragement and guidance, their progress is often astounding. There is something about learning piano as a child that is challenging and appeals to young imaginations! Numerous studies by neuroscientists have determined that playing the piano has a positive effect on brain development, especially in young children. Memory functions, dexterity, hand-eye coordination, problem solving, listening and communication skills all benefit from learning an instrument and engaging in regular practice. It takes focus and dedication to learn an instrument and progressing through the levels is very satisfying. This has a positive influence on many other areas of your child’s life including school, sports and social activities. Putting in the practice before a recital provides an understanding of what it takes to learn something new and perform well. Another benefit of learning piano as a child is the early development of music appreciation. Learning to play an instrument gives you a unique insight into the craft of songwriting, arrangement and performance. It is wonderful to be inspired by the talents of other musicians and the music of different cultures from around the world. Introducing Your Child to Learning the Piano? There is an advantage in having a piano in your home when your child is still very young. I know that many homes don’t have the space or the budget for an acoustic piano so I often recommend buying a digital piano. These days they sound and feel just like an acoustic piano and they come in a wide range of sizes and prices. Digital pianos also have headphones which can be a blessing in an apartment! If buying a piano seems like a bit of gamble for your five year old, it is also possible to rent a digital piano and even buy it later if it is a hit with your child. I encourage parents to ‘play’ games on the piano with their child well before they take formal lessons. This develops a playful familiarity with the instrument and an eagerness to learn. 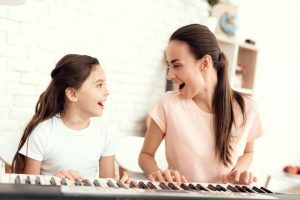 There are lots of suggestions about games and activities in these two articles: Things to do Before Your Child Begins Lessons & Fun Games to Play with Your Child on Piano. The main thing in the early stages is to have fun! It is a great idea to find simple songs that your child loves to listen to and to learn to play these together. It is also useful to sing, dance and drum together. These skills will make a big difference when your child begins their first piano lessons. It is a blessing if you have a child that is interested in playing an instrument. If your child likes music, singing or dancing, the piano could be a doorway to a lifetime of enjoyment. Who knows, you may even want to join in on the fun and take lessons yourself!